A while ago I ordered some herbal tea at the Chez Panisse Café in Berkeley. The tea arrived in a large, clear, glass teapot, filled with green leaves and hot water. The tea was lovely — light, lemony, minty. After we finished it, my curiosity got the best of me and I started fishing out the leaves from the pot, wondering what was in this tea anyway? Our server noticed this odd behavior and quickly came to the table offering to provide us with fresh leaves. “These leaves here are mint, but what are these long green ones?” I asked. “Lemon verbena,” was the answer and she happily addressed my battery of questions about this herb. Lemon verbena is a bushy shrub that grows quite well in Northern California. It originally comes from South America, but has been cultivated in Europe since the 1600s. Lemon verbena has a strong lemon scent and is used to add a lemon flavor to many dishes. 1 Heat water: Bring a pot of fresh water almost, but not quite to a boil. 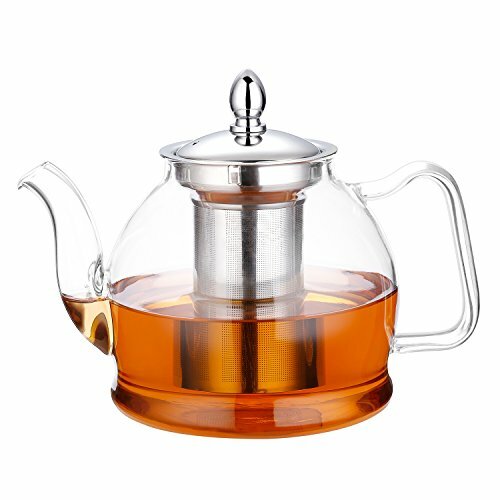 2 Pour over mint and lemon verbena in tea pot: Put the mint and verbena leaves in a teapot. Pour the hot water over the leaves. Let sit for 3-5 minutes. Strain into tea cups. Hello! All photos and content are copyright protected. Please do not use our photos without prior written permission. If you wish to republish this recipe, please rewrite the recipe in your own unique words and link back to Mint Tea with Lemon Verbena on Simply Recipes. Thank you! We have a lovely smelling Verbena bush and plenty of Mint. Just brewed my first pot of tea, it has a light green colour, pleasant odour. Nice taste, not to strong but good. I’d love to grow my own plant but where can I find lemon verbena seeds? This is really good! Since it’s really hot right now, I decided to make this into iced tea instead. It’s a little milder taste when you add in the ice cubes, but still makes a delicious cool beverage. Definitely try this! Hi, I noticed in the comments for Lemon Verbena Tea, that someone had wondered if Lemon Scented Verbena had any medicinal properties. I wonder how it does in the Sunset fog though? I love your recipes. I drink mint tea for nausea. It works better than most medicine. I didn’t realize the stems cause bitterness. That’s a great tip because I’ve made “light” mint and water that ended up sort of bitter. Verbena is actually something unto its own. “Lemon Verbena” is a convenient name because Americans needed something to pin it to. When I worked with a Japanese cake maker a few years ago she tasted my verbena ice cream and said it tasted like ginger to her. I’m glad to hear your plant is doing well. They can be quite fickle and don’t always proliferate. Locally I buy my verbena from Knoll Farms. But something to note: if you are taking it home from the store/market and are not going to use it right away it rots quickly. I lay the stems on a parchment lined cookie sheet as far apart as I can manage, and keep them in a warm dry spot until they all dry out. Infsuing with dried leaves produces a slightly different flavour, but it remains light and delicious. The dried leaves can also be bought in bulk from Rainbow Grocery in SF or from certain Tea shops. Would lemon balm work in place of the lemon verbena? Because I have a bunch of that and a bunch of mint that is just dying to be used!